For the final showdown between Tijuana's Adapta Project and Sezio, Jorge Tellaeche and Wes Bruce went toe to toe at Cream Coffee Bar. Each Artist engulfed their designated wall with a massive amount of recent work. Jorge's vibrant and detailed series is pictured above and below. - all photos by Alex Oat. Wes Bruce's piece was enormous and incredibly thoughtful. I really can't begin to describe what went into this process, so if you missed his feature - go and read it here. Wes' sewn-together piece involved thoughts, pictures and memories from so many of his close friends, and Cream was packed with guests taking in all of the detail (and also to see Joel P. West, Wes' good friend and roommate, perform songs). This evening ended on the corner of Park Blvd., where Joel treated some of his more attentive listeners to an encore. This was definitely one of those moments you were glad to be a part of, even more so when it was captured so beautifully in photographs. 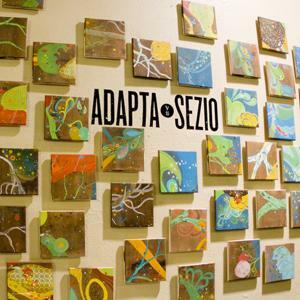 Round 3 of Adapta v. Sezio will be up in Cream through most of January, so definitely swing by to check it out. Also, check the photo gallery below for more images from the evening.